I spoke about how Google is helping developers realize the promise of cloud computing by providing on-demand access to world-class technology at an affordable price. We believe that compute — the core of any cloud workload — should be simple and fast to provision, scale without effort, and be priced in accordance with Moore’s Law. In March of this year we set a new standard for economics in the public cloud when we brought the price of core infrastructure, including compute & storage, in line with where it should be. 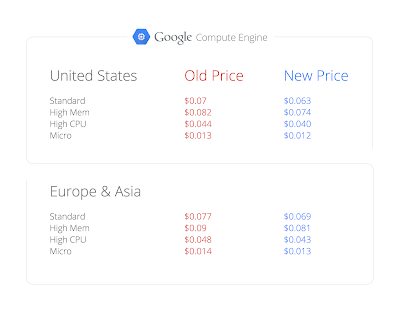 And, as predicted by Moore’s Law, we can now lower prices again. Effective immediately, we are cutting prices of Google Compute Engine by approximately 10% for all instance types in every region. These cuts are a result of increased efficiency in our data centers as well as falling hardware costs, allowing us to pass on lower prices to our customers. Using Compute Engine doesn’t just lower costs; it makes developers more productive, agile and efficient. Many development teams spend about 80% of time on what we call “fix and fiddle,” such as managing systems, fixing bugs and just keeping the lights on. Only 20% of time is spent how it should be — building new products or systems that will be platforms for growth. With Compute Engine and the rest of Cloud Platform, it doesn’t have to be this way. A small company like Snapchat can reach a global audience with just a few people on their development and operations team. Workiva, which processes financial reports for 60% of the Fortune 500, can focus on solving the needs of their users rather than managing infrastructure. And, this past World Cup, Coca Cola and Cloud Platform partner CI&T built and ran the Happiness Flag campaign in just a few weeks with the help of Google Compute Engine. The campaign solicited over three million contributions from fans in more than 200 countries. We've made a lot of progress in the past year and look forward to what's coming next. Tune in to Google Cloud Platform Live on November 4th to learn more about where we’re headed. Today at Atmosphere Live, I spoke about how Google is helping developers realize the promise of cloud computing by providing on-demand access to world-class technology at an affordable price.